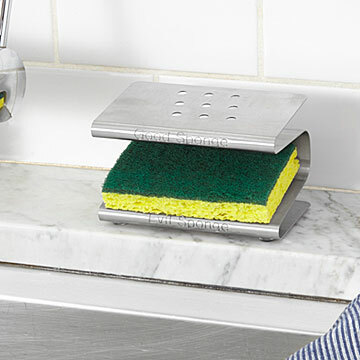 This stainless steel rack helps expunge bacteria by keeping your "good sponge" and "evil sponge" separate. To wipe out bad guys (germs), you have to sink to their level--the kitchen sink, to be exact. This industrial-grade stainless steel rack helps expunge bacteria while keeping it clean with two distinct shelves for your separate sponges. A slot for your "good sponge" (used for counter top and dishes) and "evil sponge" (sink and drain) helps you keep track of your scrubbers without sacrificing space or style. The SpongesterTM was designed by Michael G. Frank to appease a former germ-conscious roommate, its smart shape prevents cross-contamination with bendable, semi-perforated shelves that encourage drainage and inhibit bacterial growth. Made in New York. Top rack dishwasher safe. Stainless steel is a rust-resistant material however, rust can still occur under certain conditions. For best results, wipe dry occasionally. We keep different sponges for dishes vs general dirt (e.g. floor), and this is great for tidying up the area next to the faucet while keeping them apart. I have been wanting this forever. I use sponges in my kitchen, one for dishes and one for the floor, etc (I have kids and a dog, right? Need I elaborate?) This is the best way to keep them straight. I should have bought it years ago. It's clever, a little cheeky, and well designed. It's back! I bought 3 more!! Makes it so easy to keep the sponges straight for the "good" and "evil" uses. Best gift ever. I love the design and it keeps me company while cooking and washing dishes with its positive mood! It's about time someone developed a holder for our sponges. It's so important that the sponge doesn't sit on the sink and gather germs. This works great, with air holes to keep the sponge dry and keep out germs. Excellent Design!! The sponge holder sits by my kitchen sink always, keeping it more organized.